Odhran Connelly from Southern Regional College in Northern Ireland was victorious at the SkillBuild 2018 National Finals in Wall and Floor Tiling. Callum Pearson (Highly Commended from Leeds College of Building) and four other competitors. 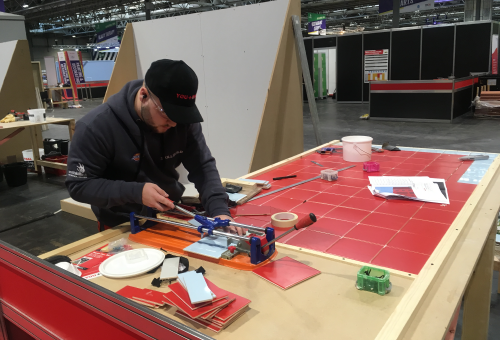 The finals of the national construction competition for apprentices and trainees took place at the NEC from 15 – 17 November as part of the WorldSkills UK Live exhibition. Throughout the three-day, 18-hour competition, contestants were asked to tile a wall and floor based on a 3D building design and 150mm x 150mm ceramic tiles. Competitors fixed the tiles with BAL Max Flex Fibre and BAL Rapid-Flex One and grouted with BAL Micromax2 Snow including BAL Micromax Sealant for all movement joints. Dave Rowley, BAL training manager and lead judge for SkillBuild 2018 said: “Many congratulations to Odhran for winning a hard-fought final competition. The standard of fixing throughout the three days was exceptionally high which made adjudicating very hard. SkillBuild is now in its sixth year and is run by the CITB (Construction Industry Training Board). The competition sees the very best students from Regional Heats compete in ten construction occupations, including tiling, to be crowned the overall SkillBuild winner in their chosen trade. As a national SkillBuild winner, Odhran is eligible to compete at WorldSkills 2019 being held in the Russian city of Kazan.